Ms. O Reads Books: Well. It's been a week. Again. And this just makes me more grateful to all of the great bloggers out there who continue to come up with great content even when life is just ... distracting. Haven't slept all that well the past couple of nights. 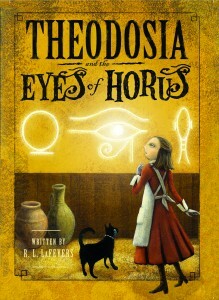 But the GREAT part about that is I finally finished Theodosia and the Eyes of Horus. I love Theodosia. So funny. I wish I'd kept better track of funny quotes for you. One about research was just a hoot. If you haven't read them ... make sure to check any of the four out. This one really might be my favorite, though. Shall I be honest? Wasn't in the mood to keep track of quotes because somebody broke into my house and stole a bunch of stuff. Just stuff. But it's upsetting all the same. But hey! Still liked the book. Even when there was a break-in as part of the story. Oddly ironic.